The majestic scenery and rich wildlife we saw in primary rainforest in the mountainous Kinabalu National Park (KNP) and lowland Danum Valley, both in Sabah state, Borneo, were in stark and numbing contrast with the endless expanse of palm oil plantations that encircle them. During many hours of driving between KNP and Sepilok, and from there to entrance to the Danum Valley, we passed hundreds of miles of row upon endless row of oil palms, of forest being stripped bare and drained to plant more palms. 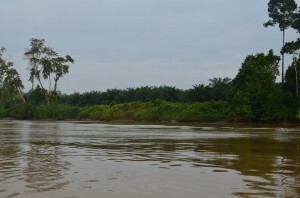 On observing palms along the Kinabatangan river banks, we learned that the river “forest” is somewhat of an illusion. The river forest is a remnant secondary forest strip half a kilometer wide sandwiched between more plantations – the photo here shows that it is zero meters wide in places. Are Sabah’s primary rainforests, virtually impenetrable early last century, to be reduced to a few isolated parks surrounded by a vast expanse of a silent commercial mono-species? Are the oil palm industry’s claims of environmental benevolence credible? In 2012, Malaysia had 5 million hectares (19,305 square miles) of oil palm under cultivation in peninsular Malaysia and Borneo. A hectare (ha) is 100 by 100 meters, or about 2.47 acres. The largest Malaysian plantations are in Sabah state Borneo where we were visiting. Sabah has 1.43 M ha (5,521 square miles) of oil palm plantations – that’s over 3.5 million acres! Plus almost 4,000 square miles in Sarawak state to the south. More than 17 percent of the land area of Sabah is already oil palms. It is no wonder we saw so many palms. 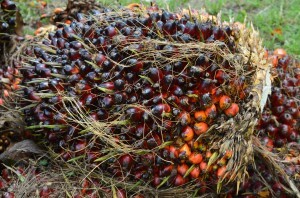 Malaysia is the world’s second largest palm oil producer; production was 18.7 million metric tons of palm oil in 2012. Indonesia is the largest. Combined, they produce 85% of world production, mainly from the Tenera hybrid of the African oil palm (Elaeis guineensis). Palm oil is a major source of export income for Malaysia, bringing in R80B ($27B) in 2012.USA is the fourth largest consumer of Malaysian palm oil importing over 1 million metric tons in 2012. Have a look – it’s in many of the products you eat and use, from baked goods to soaps. Here in the US, most palm oil is used in food; in shortening, cooking oil, margarine, and as a cocoa butter substitute in candy and chocolate. 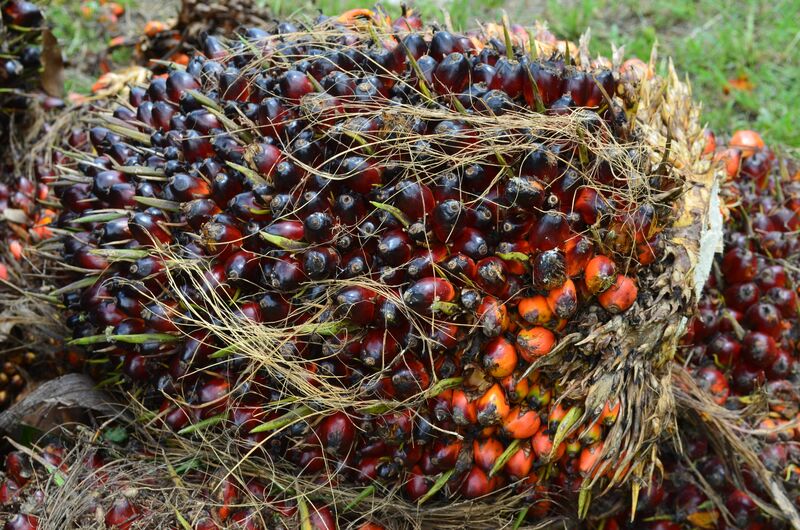 The lure of oil palm is its productivity. It is the most productive oil seed in the world and now produces about 38 percent of the world’s vegetable oil. With care and fertilizer, a hectare of oil palm can produce about 4 metric tons of crude palm oil per ha per year, average production is closer to 3 metric tons (a yield of about one metric ton of refined palm oil per acre). Compare this with the average oil produced by soybeans or rapeseed, 0.38 and 0.75 metric tons / ha/year, and you can see the attraction. The photos of the pile of “fresh fruit bunches” were taken near the Klias Peat Forest Field Center a few hours southeast of Koto Kinabalu. (It is a drained peat forest – the peat is drying and desiccating – still a peat forest?) Each fresh fruit bunch weighs in around 20 to 30 kg (44 to 66 lbs), 60 to 65 percent of which is fruit, of which 20 to 25% is oil. Each bunch has 1,500 to 2,000 individual fruits that have a fibrous mesocarp containing palm oil (it feels really oily) and an inner thin-shelled kernel that contains much smaller volume of higher value “palm kernel oil”. Commercial oil palm processing starts with high-pressure steam sterilization followed by tumbling in a drum to separate the fruit from the stalks. The fruit and nuts then pass into a digester and screw press that extracts crude oil and produces a fiber and nut “cake”. The oil goes on for clarification while the cake is dried and the fiber separated from the nuts in a winnowing tower. The palm kernels are then broken out of the nuts in a water/clay separator. The processing produces a lot of waste biomass including the stalks, fiber, and nut shells. Because the biomass has a reasonably high energy value, some plants use it to generate the electricity needed to run the processing plant. The stalks are also used for fertilizer. On average, each 1,000 kg of fresh fruit produces about 225 kg of clarified oil, 490 kg of biomass and 67 kg of kernels. It also produces 180 kg of sludge. The sludge adds to the large volume of process water used in production. Waste effluent includes condensate from sterilization, said sludge, and waste water from the nut separation. Each 1000 kg of fruit processing also produces about 650 kg of acidic effluent with a high biological and chemical oxygen demand (BOD and COD). Control of BOD in effluent – which, if untreated, kills streams – has been a major environmental concern. The industry literature claims the oil palm is a better carbon sink than the primary forest it replaced. This claim is questionable and has been refuted in a number of technical studies. The industry analysis does not consider the loss of peat forest swamps, which when wet, hold hundreds of years of carbon, nor does it consider the energy need to produce the fertilizers being used to increase productivity, or that oil palm plantations are hotter than primary forest. The value of ecological habitat, of clean river water and bio-diversity, are simply not part of the equation. The Malaysian government has said it intends to keep 50% of Malaysia as forest. If this truly is a goal rather than PR, then it’s an admirably one when compared with the US record of preserving primary forest, and compared to much of the rest of the world too. But if the 50% goal is real, it’s not clear that it will be applied to Borneo given that the two Borneo states of Sabah and Sarawak are the prime areas for growing palm oil in Malaysia. And just how close reality is to the 50% goal is hard to verify in Borneo because the government does not report data for total deforestation, which also includes deforestation for the timber trades, and other plantations such as rubber, cocoa and coconut. Extensive deforestation due to illegal logging is reported to have taken place between 1975 and 1995. What is most disturbing is the horrendous and permanent loss of bio-diversity. The Heart of Borneo Project has documented there are 1,200 trees species and over 220 bird species in the primary Borneo rainforest. But there are only one introduced tree and about 12 bird species in the palm plantations. To convert almost half of a county of rainforest into a single commercial mono-species subject to the vagaries of economics and the whims of opportunistic plant pests carries a very high economic and environmental price. 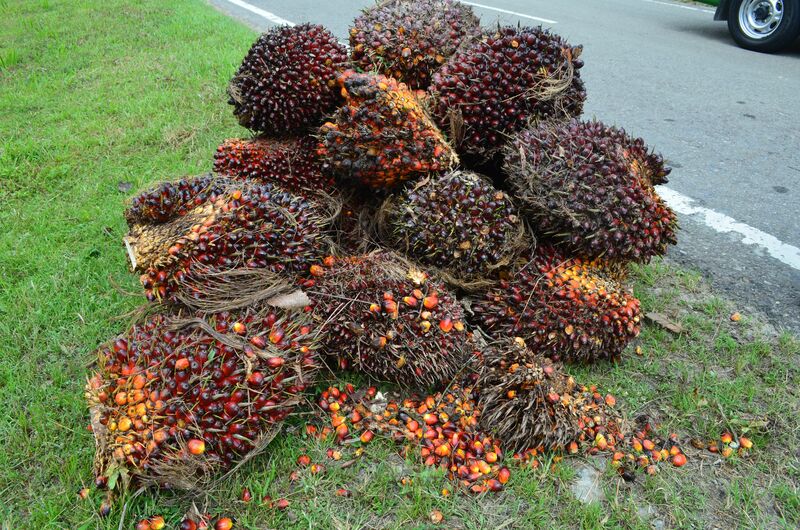 When we buy oil palm products, we contribute to that loss. Borneo may seem a very remote and distant place, thousands of miles away in space and imagination. But we are all connected in this ever-shrinking and over-stressed planet. Ignorance of what we are contributing to will be no excuse in the eyes of future generations. Center for International Forestry Research, 2011. 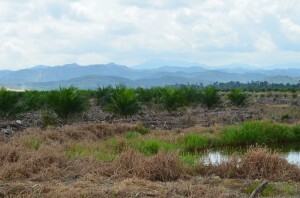 Working Paper 78: The local impacts of oil palm expansion in Malaysia. An assessment based on a case study in Sabah State. EU Delegation to Malaysia, 2012. The Malaysian Palm Oil Sector Overview. June. Siew Wai-Lin, 2011. http://lipidlibrary.aocs.org/processing/palmoil/index.htm Malaysian Palm Oil Board, Kuala Lumpur, Malaysia. Wow…this is disturbing indeed, especially that palm oil is used in so many mass produced foods we all have in our food cabinets. Wow, disturbing indeed. Time to clean out the pantry and rethink.